In an initiative that would take the Broadband Internet service along with VAS offering in Mumbai to a new level, Mahanagar Telephone Nigam Ltd (MTNL), the number one broadband and telecom service provider, Introduces a new High Speed Unlimited Broadband plan with Unlimited Games On Demand service at Rs.1350 with 752 kbps speed. MTNL’s new Unlimited-High Speed Broadband plan with Unlimited Games on Demand (GoD) service comes at monthly rental of Rs.1350.With this plan subscribers can access Broadband service with Unlimited downloads at 752 kbps speed and also enjoy unlimited access of collection of more than 300 on line games on MTNL Games on Demand portal. On this portal new game added every week, Free Download of one Mobile Games every month and Special discounts offer on all Mobile Games. Mumbai’s number one ISP MTNL is providing the truly Unlimited Broadband connectivity without any “Fair Usage Policy” so there is no limitations regarding download and uploads. Free One Mobile Games Every Month. To Subscribe the plan Call 1500 (24×7) from MTNL Landline. 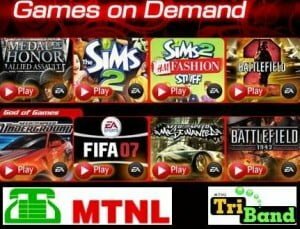 1.After the subscription of this Plan MTNL customers need to visit http://games.mtnlmumbai.in and register on the service using their DSL id and password. 2. Post signing up as above, they have to download a ‘GoD player’ (please check ‘install player’ button on the right hand side bar). 3. The consumer can then go on to choose any of the games from the categories listed (towards the top of the page such as ‘quick games’ or ‘Action’) or from the drop down menu (‘select game’) on the right hand side bar. 4. Once the consumer selects the game, he is taken to the page which presents the basic information about the game such as download size, estimated time of download, whether it can be played on the consumer’s computer or not (suggesting hardware / software upgrade where necessary) and basic information of the game. 5.The consumer has to click on the download / play button which will start the process of downloading of the game – this is only a one time process i.e. the game has to be downloaded only once. 6.Once the game is downloaded, the consumer is given a voice and visual prompt – ‘click play to launch the game’ and once he / she clicks the ‘play’ button, the game is launched. 7. Please note that the consumer needs to be online in order to play. So every time the consumer wants to play, he / she has to log on using his username and password and then click on the game to play. Going offline will disconnect the game. 8.The whole process is supported by a series of sequential prompts making it easy for first time consumers to follow. Opera mini and nimbuzz not accessible using aircel or reliance gsm.. Help needed..
You probably have WAP settings with proxies which won<t work with 3rd party browsers & applications. You need to call your operator for Internet settings without proxies.